Punti Necessari: 4200 Please note that, for now, you cannot download content from our platform directly onto a mobile device (phone, iPod, iPad, tablets...). You need to download your items onto a PC or Mac, and then transfer them onto your device in the normal way. We are working on allowing direct downloads to mobile devices but this is not possible in the current version of the platform. Sorry about the inconvenience! ABOUT THE GAMEThe 17th Century Caribbean – beautiful, seductive and dangerous.Accompany Morgane in her quest to find the legendary Golden Turtle and experience the story of a young girl who grows into a pirate captain!Make decisions, but remember - your actions have direct consequences for those depending on you. Your journey will take you across 5 different islands and you will interact with 40… characters that can help you - or not! Explore over 50 heavenly and beautiful locations in glorious 1080p HD (Sony PS3 & PC) and discover the truth behind the most important secrets in the Caribbean! What is the truth behind the legend of the Golden Turtle? Why is your intriguing merchant client - the fabulously rich Thomas Briscoe - desperately looking for it? Could it be possible that Uncle Eduardo came back from certain death after being lost at sea? And most of all, are your shoulders broad enough to bear the responsibility of being the Captain of your very own pirate ship? The answers to these questions now depend on you... Written by Steve Ince, award winning writer of adventure game 'Broken Sword', Captain Morgane and the Golden Turtle is a spin-off from the smash-hit adventure game 'So Blonde'.KEY FEATURES A colourful and accessible Point-and-Click adventure	A new hero to develop and storyline to immerse into, providing over 12 hours of gameplay	A semi-open world set across 5 islands 40 unique characters split over 50 beautiful locations 6 new mini-games and dozens of new puzzles Story by award winning writer Steve Ince	PC Full 1080p HDSYSTEM REQUIREMENTS OS: Windows XP / Vista / Seven Processor: Pentium 1.6 Ghz Memory: 512MB RAM Video card: 64MB Graphic Card DirectX 9-compatible HDD size:	3GB DirectX: Direct X 9 or higher Published by Reef Entertainment Limited 2011, All Rights Reserved. Reef Entertainment is a registered trademark of Reef Entertainment Limited. All Rights Reserved. © and ™ Wizarbox 2011. All Rights Reserved. 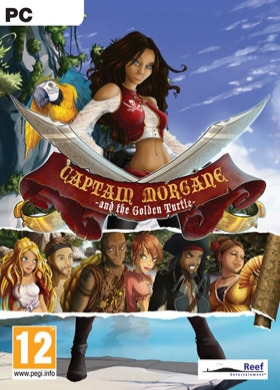 CAPTAIN MORGANE AND THE GOLDEN TURTLE is a registered trademark of Wizarbox Limited. All Rights Reserved, used under license by Reef Entertainment, All Rights Reserved.